Reader Beware! 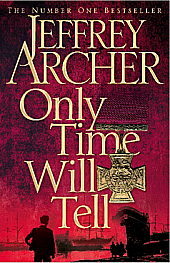 Jeffrey Archer’s Only Time Will Tell is not a stand-alone book; it’s the first in a series. The second book, Sins of the Father, has already been published, but there are rumors of the series eventually including up to five installments. Why do I tell you this before anything else? So that you, unlike I, will not get to the end of the book – having felt the impending doom for at least 50 pages – and wail “NOOOOOOOOO!” as you realize that the answer to the major mystery will not be revealed. Series books are harsh mistresses when you aren’t prepared. Anyway. Only Time Will Tell is the story of Harry Clifton. Harry is a young English boy living in a solidly blue collar home with his mother, uncle and grandparents. His uncle works on the docks, as did his late father, and Harry is sure he will follow in kind. His mother enrolls him in school, hoping for a brighter future for her son, but it isn’t until the chance of a choral scholarship to the prestigious St. Bedes that Harry actually decides to go to class. It is there that Harry meets the boys who will become his best friends and we follow the lives of the boys as they grow up within the English school system. Harry is always the focus – this is the story of his life, wrapped up in the lives of his friend Giles, his mother, Giles’ parents and family and a mysterious old man who lives in a train car down by Harry’s early love – the docks. What commences is a family saga spanning 20 years between the first and second World Wars. Jeffrey Archer is a terrific storyteller. His characters are generally good or bad, though with enough complexity that they don’t feel too trite. He’s most certainly not above having someone behave out of character in order to move the plot forward – which is normally something I would find irritating in a book based mostly on the main characters and their lives rather than a more structured plot. I didn’t mind it in Only Time Will Tell, however, because Archer does have a plot line going here. Several, in fact. We’re watching Harry grow up but we’re also learning all sorts of secrets about his family as we go. And there are a lot of secrets floating around in this boy’s life. Archer chooses to tell his story through several different characters. Each segment begins with a short chapter told in the first person by whomever we are going to be hearing from, then goes into third person focusing on the new “narrator”. Each character has slightly different – or more – information than the others, so as we switch perspective we also slowly begin to piece together the real story of Harry’s life, the death of his father, his journey through school and his relationships with family and friends. The style takes a little getting used to, but is very effective. The plot slowly unravels as we learn how each character reveals what they know and what they have done and how it all affects Harry and his family. I have to admit that I was not looking for a long series of books about these characters and presumably their descendents. I would have preferred to simply have the questions posed throughout the book answered and be on my way to another book. In fact, I would sort of like it if someone just answered my questions so I wouldn’t have to read the next book(s). The direction the story took right at the end was not as intriguing to me as everything that came before and I can’t say that I’m all that interested in plowing through the trials and tribulations introduced in the last 25 to get the answers to the questions posed in the first 25. Only Time Will Tell was a relatively fast read and I did like quite a few of the characters very much, but not quite enough for another (or 4 more) books about them. Overall I enjoyed the story and the characters in Jeffrey Archer’s Only Time Will Tell. But I’m not quite ready to commit to the next book to find out what happens to Harry as WWII begins. The books itself is easily 4 stars, but its place as book one of who knows how many makes it more trouble than it’s worth. 3 stars out of 5 and only recommended for Archer fans who are ready for a multi-book saga.